An ovarian cystectomy is a procedure commonly used to remove a cyst on an ovary, in circumstances where it is desirable to leave a functional ovary in place, particularly in women of childbearing age. The term ovarian cyst is used to describe any collection of fluid surrounded by a very thin wall, within an ovary, and these cysts can vary dramatically in size from as small as a pea to larger than a melon. Ovarian cysts can affect women of all ages, although they occur most often during a woman’s childbearing years, and are typically harmless, or benign. 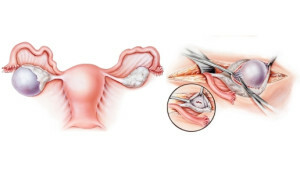 Some ovarian cysts, however, can cause problems such as pain and irregular bleeding, in which case an ovarian cystectomy may be required to remove the cysts. In most cases, an ovarian cystectomy is preferred over an oophorectomy – in which the whole ovary is surgically removed – particularly in women who want to become pregnant in the future. Cysts on the ovary are very common, particularly functional ovarian cysts, which typically don’t require treatment and usually go away on their own within a few months. In some cases, however, removal of an ovarian cyst may be advised, especially if the cyst is large or if the patient is experiencing symptoms. Our specialists at GREFI are trained in the removal of ovarian cysts, and offer ovarian cystectomy procedures to patients throughout Puerto Rico.